Same great tea as our bings, just in a different size. The only rolled Puer ball on the market. Available on our site and strong ChaQi, enjoy and blessings. This was a gift from someone. The ball is tightly rolled, and it doesn’t offer much of an aroma. If I wear to maximize my imagination I believe I caught hints of hay, light wood, and oatmeal. I warmed up my gaiwan and rolled this little orb inside. The scents picked up with some harsh grass, wet wood, and an unpleasant tone. I would describe it as oversteeped metallic tea. Nonetheless, I washed the orb and prepared for brewing. The taste was oddly sweet and light. The taste was basic and noted as “tea taste”. The drink had a slight sweet aftertaste. I experienced no depth with this tea or complexities. The tea tasted like tea, haha. This was very plain and nothing exciting to note. Qi wise, I felt a strange head high that was reverberating within my skull. The feeling was not good. This was a weird tea, and I don’t think its for me. 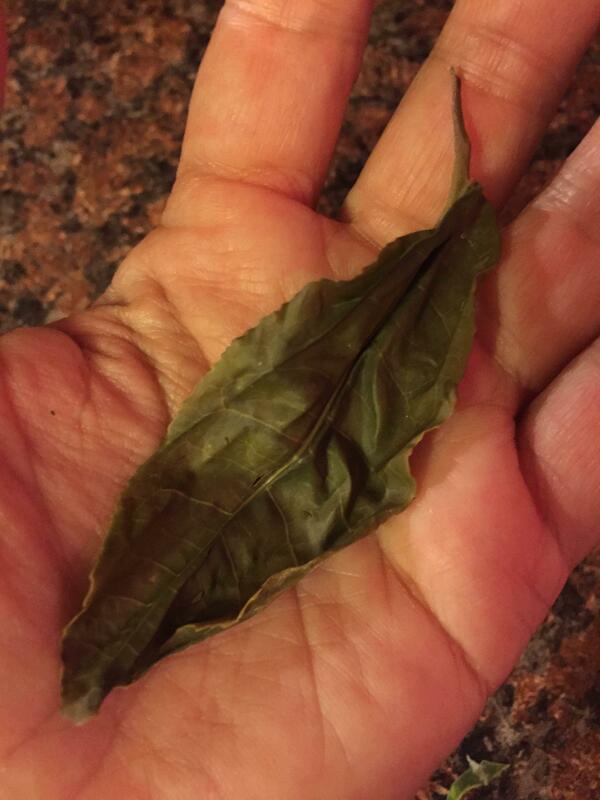 This little ball of tea was sent to me from my beloved tea sister, Sil. I have a little time today, in between loads of laundry, students, & house projects, so I’m enjoying this tea, some time for being present, and just breathing. First off, I love the hand rolled ball of tea! I tend to shy away from sheng when it’s been machine pressed into touchas, they usually just aren’t that good. They tend to fall apart into tea dust, or have sticky rice taste. Not my cup of tea. This, on the other hand, is beautiful, the real deal. Beautiful full budsets, lovingly gently rolled into a ball, they opened out to fill my yixing with a deep olive drab (my most favorite color in the world) and the aroma of clean hay with a little pot mixed in. The tea itself is immediately a beautiful amber, & tastes of minerals, sweet grass, a little caramel, and a slight apricot tartness. There’s a pleasant eucalyptus sensation as well. I combined 2 steepings at a time in my mug, and the first mug cured my headache, and gave me an almost immediate buzz, opening my sinuses & chakras, so energy can flow. I can especially feel this one in my shoulder blades & neck. Energy is now flowing freely down my arms, and I think I might want to go play my harp in a few minutes. Round 2 (steeps 3 & 4…20 seconds each) is equally energizing & more tingly, slightly more bitter, & now my head is glowing from the inside out, like a light bulb. This is why I love raw puerh, and I need to stop being so busy all the time, & make more time to drink it. I will continue enjoying this until its lost its power. I’d really like to have a beng & will add this to my wishlist. I feel fantastic! Thank you Sil! Brewed gongfu-style in a ceramic gaiwan. Two 5-second rinses (because the first cup, 5 seconds, was too weak). Steeping times: 10, 10, 15, 20, 30, 40, 60, 90, 120. I carefully unwrapped the paper (it’s taped in my tea journal for keeps) as if it were a special present. This was the first time I had a sheng ball, so I had to admire it – the tightness in which the leaves were pressed, the summer plant-like colors of the leaves, the lightness, or weightlessness, of the ball – before placing it in the bowl. It didn’t take long to unfurl. After the two rinses and the first steep, the leaves were already free. This was the sweetest smelling sheng whose aroma I’ve had the pleasure to savor. Apricot jam fills the gaiwan after each steep, stronger than the real thing. Given a few seconds, a midsumer meadow arises, then green peppers. The liquor is golden yellow, thick, smooth and, at first, cloudy with leaf bits. It has a full-body yet is mild in flavor. The first infusion tastes of sweet hay. It’s also a little sour, but this disappears shortly. The second infusion is even sweeter, a kind of fruity sweetness, with a mineral note. I liked this cup the best. The rest of the infusions are tingly on the tongue. They consistently offer sweet hay, and the texture becomes a little thicker. Silly me – I checked the website’s instructions after I began the session. Which is why the temperature reads 200 and not 185. Which is probably why the flavor weakens at the seventh infusion. I have a hard time making teas last more than ten infusions while being brewed in a gaiwan. This is one tea I would have liked to have more a longer relationship with. Take me back to that summer meadow! I’ve been enjoying this tea this morning while cleaning my apartment. Lately I watched a few episodes of Hoarders and that show is really scary! I wonder how many of us are tea hoarders? At least I have no problem getting rid of things I don’t like but 2015 seems like a good year to focus on paring down the collection. I’d like to 1/2 the teas I have now and stop buying so many more. So… on to this sample. It’s a little rolled ball of sheng puer. For such a young tea it is fairly mellow when you keep the steeping times short. When the steeping times are a bit longer (like 45 sec to 1 min) it gets very assertive and somewhat bitter. I guess it depends on how you like your tea. Around 15 seconds it is nice and earthy, mostly sweet with a bit of lemon. If I was in the market for another sheng to drink immediately, I would definitely consider a beeng. I did get a package of their mao cha which will suffice for now. Halve your cupboard of teas? Is that healthy? I’m certain there are legitimate tea hoarders on here! Haha I too live in a studio with a tiny kitchen, so I can definitely relate on running out of cupboard space. lol. im sure its not THAT bad. he has to see my “treasures” ! My cupboard says 208 currently. Hah, show them mine!!! They will change their mind! I don’t have all of my teas in the cupboard. I like this tea a lot. It’s smooth and easy drinking. Almost sweet. Tasty. Word of warning: do not oversteep as it become a bitter mess. UGH. This is my other puerh that i’ve been drinking for the other half of today. I’m not sure if i’ll have time for a third one tomorrow but we’ll see :) I’m still working my way through this one, hoping that i don’t crash heh. This was one i picked up the other day when misty pines was offering 2 for the price of one..so i nabbed it, so that i could have an extra for my tea sister terri! Initial impressions are that this is similar to my favourite puerh from mandala but without the smoke. instead this is on the sweeter side of things. More to come later as i have more of this over the course of the afternoon. Having this tea again. I was unpacking my pumidor and putting the tea into cardboard boxes for my move to a new apartment so I thought I would drink this. It is hard to say if a year and a half or so in my pumidor has improved this tea. It is still sweet in nature with little bitterness. It has not developed much in the color of the tea soup that is for sure although it looks a touch darker. There is a moderate amount of astringency to this tea. It still has that characteristic apricot sweetness that in my experience Misty Peak raw puerh has. I steeped this eight times in a 120ml gaiwan with one rolled puerh or 8.4g leaf in 200 degree water. I gave it a 10 second rinse and a 10 minute rest. I steeped it for 5 sec, 5 sec, 7 sec, 10 sec, 15 sec, 20 sec, 25 sec, and 30 sec. We will need the new address. After I unhook my computer for the move I will essentially go dark on Steepster but will still be reachable on Instagram through Direct messaging. All my gongfu teaware will be packed for the trip so I won’t be posting anything there for a few days either.